The cheapest Windows Phone available, but does it sacrifice too much? For under £130, it's a decent phone - but we can't recommend it over the cheaper-and-better Lumia 710. Updated: We've taken another look at the Lumia 610, with a new price drop making it much cheaper - but does it make it better than the still-cheaper Nokia Lumia 710? The Nokia Lumia 610 has placed itself squarely at the low end of the smartphone market, with just 256MB of RAM and a single-core 800MHz processor. Alongside the new stripped down Windows Phone Tango operating system and a new, more wallet-friendly UK price tag of only around £125 on Pay as you go, or free on contracts starting from just £13 per month. This oddly puts it at a higher price than the better-specified Nokia Lumia 710 - we're not sure what's going on here, especially in the UK market. Although the Nokia Lumia 610 is broadly competing with every other low spec and low price handset, its real competition will come from other Windows Phone Tango handsets, such as the ZTE Tania. It remains to be seen how they'll fare, since the Nokia Lumia 610 has beaten them to market, so as a pioneer of the new budget-conscious operating system, how does the Nokia Lumia 610 stack up? Based on physical impressions, it isn't likely to stand out in a crowd, with a plastic body and a dinky 3.7-inch 800 x 480 TFT screen. The sides have a metallic gleam to them but it's never likely to be mistaken for real metal, and the illusion is lost altogether once you actually hold the phone, which feels plastic through and through. It's not flimsy, though, with a reassuringly sturdy back cover and a generally solid feel. At 131.5g, it weighs about what you'd expect for a phone of its size, which is to say that it's light, but given its relatively small dimensions of 119 x 62 x 12mm, the weight feels about right. This all serves to give the Nokia Lumia 610 a feeling of surprisingly high quality for such a cheap phone. Especially when compared, for example, to the substantially more expensive Samsung Galaxy S2, which has none of the density or solidity to it that the Nokia Lumia 610 has. 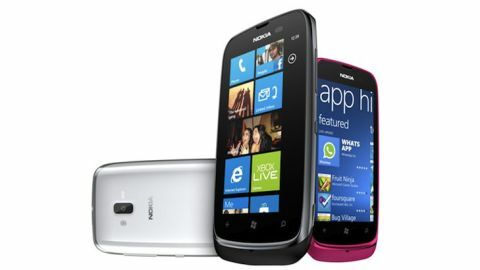 Sticking to the trademark bright and bold colours of the Lumia range, the Nokia Lumia 610 comes in magenta or cyan, or if you're feeling more conventional, black or white. The phone features several hardware buttons, all of which are positioned on the right-hand side. There's a volume rocker near the top, the power button in the middle and a dedicated camera button at the bottom. The layout isn't totally ideal, since - depending on how you're holding the phone - the camera button can be awkward to reach without using two hands. And having the power button so close to the volume rocker means it's easy to press the wrong button. We can't help but feel that having the power button opposite the volume rocker and moving the camera button slightly further up the body of the phone would have worked better, as it requires some thumb movement to turn the phone on when held naturally in the hand. In addition, the Nokia Lumia 610 has soft key buttons just below the screen for home, back and search. These are intuitive and feature pictures of each function, making their use obvious even to someone who's never used the phone before. The ports, meanwhile, all sit along the top of the phone, with a 3.5mm headphone socket in the centre, and a micro USB connector on the right. There's also a wrist strap hole on the top-left, while the microphone sits alone at the bottom of the phone. There's no microSD card slot, which is especially disappointing given the paltry 8GB of internal storage. The battery cover requires a slide down from the main chassis to remove - something that can be hard for those used to popping a backplate off. Thankfully, for most users it's a problem they'll only have to face once, since as soon as the SIM card is in there's little reason to remove the cover again. Although it's good to know that if you ever want to replace the battery, the option is there, even if it is a little fiddly to get at. The Nokia Lumia 610 sports a respectable 5MP camera, the lens of which lies flush with the back cover of the phone. This is always cause for concern, because scratches and smudges can play havoc with photos, although in our time with the phone, while it's certainly seen its share of smudges, the lens has thankfully remained scratch-free. Ultimately, while it's not going to win any design awards, the Nokia Lumia 610 is a reasonably attractive and well built handset.